China Times, based in the Den Haag Chinatown was launched in 2003. Now it is considered as the most renowned, professional and influential Chinese newspaper in the Netherlands and Europe. China Times is a biweekly, full color newspaper and approved and supported by the Chinese Embassy in the Netherlands. 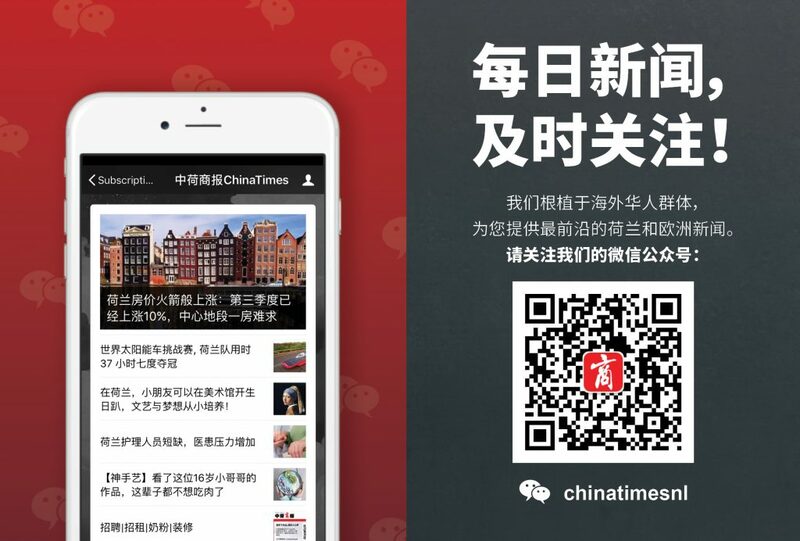 As an independent media organization, China Times runs with the purpose of serving the Chinese community in the Netherlands and Europe. Over the years China Times has been working to build a bridge between China and the Netherlands to help Chinese people and Dutch people understand more about each other’s culture. “Wherever there are Chinese people, there is China Times and wherever there is China Times, there is cultural exchange”, says Atom Zhou, founder of China Times. Mr. Zhou also has the vision to bring entrepreneurs and tourists from China closer to the customers in Europe. By using a mediamix of newspaper, online advertisement and Chinese social media WeChat and Weibo, the brand and service of the European customer will receive maximum exposure in Chinese. The publication issues 50,000 copies per edition. There are more than 120 distribution points in the Netherlands, Belgium, Luxembourg and West Germany. Besides the traditional pick-up points like restaurants, hotels and supermarkets, our newspaper has over 5000 subscribers. One of our goal is doubling the pick-up points in the coming three years. Moreover, China Times is going to focus more on new business opportunities from young Chinese generation. China Times is the only publisher in Europe who has been licensed on board. In the Economy and Business Class of China Southern Airline and Xiamen airline, China Eastern Airline and KLM/Air France app you can find China Times in the flights from and to China. The onboard channel gives our clients international exposure among tourists and businessmen. China Times provides our readers not only national and international headline news, but also economy, top interview (interview of senior officer or CEO), success story (influential entrepreneurs share their tips and success in doing business with Chinese), innovation & technology (trends from China), culture& events (places of interest, and important events for Chinese). One can also find practical information, such as visa applications, legal knowledge, tips for expats and students. And for the NBC (Netherlands Born Chinese), there are several pages published in English. We continually make improvement on our layout to make it simpler and elegant. The sections are clearly displayed into two, English and Chinese. Our design will meet client’s specific business features to yield the best result. Since October 2011, China Times launched our daily news website www.chinatimes.nl. Unlike the newspaper, the website exhibits daily and latest news about China, the Netherland and Europe. Moreover, a digital version of China Times newspaper can be read on your smartphone or tablet. The website has an English version providing detailed information for our customers, with latest news from China, advertisement tariffs and publication dates. At this moment, China Times is working on an upgrade to reach a more professional level. We think along with our clients. To get the best results of promotion, we tightly follow the latest trends in social media in China. WeChat, the leading Chinese social media can be regarded as a combination of WhatsApp and Facebook. WeChat owns over 650 million users in China, and an increasing number of users in Europe. Chine Times are pushing news in a daily base. Together with the news, we put clients’ information including advertisement, name cards or website. We place a high value on our relationship with our clients. KLM, China Southern airline, Xiamen airline, Bank of China, ICBC Bank, China Construction Bank, Huawei, ADO Den Haag are our cooperation partners. Our clients are Chinese, Dutch and European companies, organizations, restaurants and individuals. With our strategic partnerships, we strive for a win-win situation. Our marketing department offers a complete service of marketing, designing and translating. Copyright © China Times 2019 All rights reserved.